I'm very new to Affinity Photo so am getting to know where it really shines and where it falls short. By no means was I adept at Photoshop, but I found it essential for recording Actions. 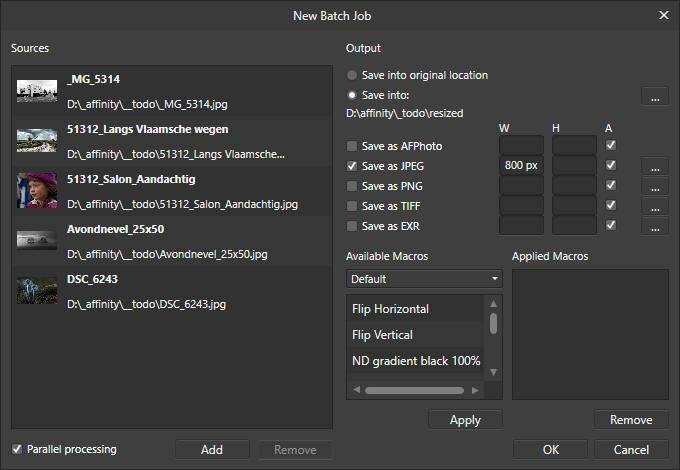 Unfortunately I've run into some issues using Affinity Photo's Macros in Batch jobs. The main one being that if I have a folder full of images that are in different aspect ratios (3:2, 4:3) it seems I am unable to record a Macro that resizes to a specific width or height ONLY. When I record a Macro and resize a 4:3 file to say 800px wide, with the size locked the height of course becomes 600px. If I run that Macro as a Batch on the folder of mixed aspect ratio images, the images that are in 3:2 ratio are resized to 800px x 600px, so they're badly distorted. So the Macro records the dimensions of BOTH edges when the resizing takes place, rather than only the edge you actually edit (as is the case in Photoshop). Is there an obvious solution to this that I am missing? Good question, I have the same problem! The solution posted above by HVDB Photography does indeed work, but what this option doesn't allow for is changing the dpi at the same time as doing the resizing (ie changing a full resolution 300dpi file to a 800px wide 72dpi file). A Macro doesn't allow for this either as the same issue arrises as per my original post in that the new dimensions that are the result of changing the dpi become a step in the Macro, which prevents the Macro from being useable for a Batch that involves images of differing aspect ratios. To achieve what I wanted to this evening I had to use a combination of a Photoshop Action to resize to 72dpi, and then the Batch job in Affinity Photo to resize a folder of mixed aspect ratio images to 80px wide. Not ideal, but it'll do for now. If there's a solution for these issues in Affinity Photo I would love to hear them. If not, I'd like to think these issues could be addressed in an update. Do Serif monitor these threads for suggestions and ideas as to how they can improve their product, or do we have to go somewhere to specifically put forth our suggestions?